March, 2019. 576 pages, 100+ illustrations. Whether you’re working on a bachelor thesis, a scientific paper, a book, it’s always difficult to differentiate between what you know and what you think you know. To find out, you have to look literally everywhere for rabbit holes and, if you find one, follow it down. Do you really know what “emergence” and other important concepts mean, or do you just think you know while interesting details hide under the comforting disguise of common knowledge? The same applies to working on a game treatment. Here, the gaps in your knowledge involve the potentials hidden behind the bland facades of default environments, standard gear, stereotyped characters, and any kind of common tropes. Instead of rabbit holes, you can imagine going after concealed gaps in your knowledge as side quests or dungeon floors, whatever vets your appetite. Not the metaphor is important but the concept of exploration and its sense of wonder—where every apple’s a banquet, every piece of scrap metal a suit of armor, every trinket a fortune. You’ll love the dungeons! For a thesis, paper, or book, you might find a description or definition that is interesting and much better suited. 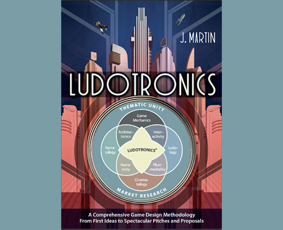 The Process phase in Ludotronics, for example, employs Peter A. Corning’s definition from “The Re-emergence of ‘Emergence’: A Venerable Concept in Search of a Theory.” For a game treatment, you might find details that surprise and delight by being both authentic and distinctive, like African Black Knights in medieval Europe or showers of diamond rain in an ice giant’s hot interior.